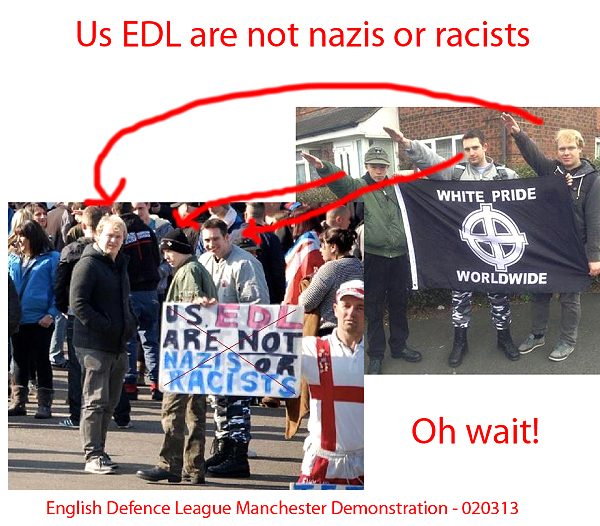 That kind of proves the point that the EDL were not formed as a white supremacist/nazi/racist group. If they had been those guys could have been open about their beliefs. As it was they had to lie and probably would have been kicked out for carrying banners like the one in the upper picture. No one is denying, by the way, that the EDL was infiltrated by guys like this. I'm just curious about whether you think it's a problem that bonafide racists can successfully infiltrate an organization and share their worldview with "reasonable people" so long as they don't outright label themselves as racists. In other words, if an organization can be accommodate bonafide racists, is that not a problem? 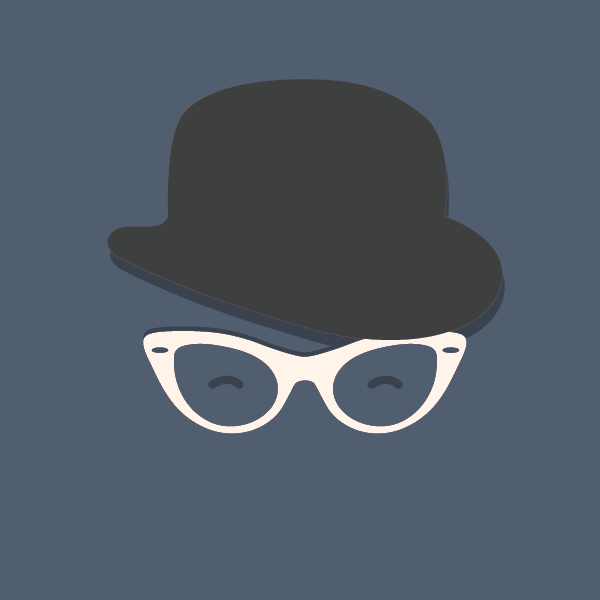 I'm really curious because I see a lot of this nowadays where someone will label themselves as something and then go on to lay out some ideas that don't seem to fit with the initial label. For example, in my freshman year I had a roommate who was a self-described libertarian. He was very religious and very clear about being anti-abortion, anti-drugs, etc. etc. A few weeks into our political science courses and discussions, he (and our entire class) found out that he was absolutely not a libertarian, but more of a traditional Christian conservative. There had just been something about the idea of being a libertarian that he liked (or found more socially acceptable). If you think (and I will accept for the sake of argument, I guess) that the EDL started as a relatively standard conservative organization, then isn't it a big problem that actual racists can comfortably exist within the organization so long as they don't out themselves as radical enthocentrists? And before 'Tino jumps in to say that this happens on the left too. Sure, I wouldn't dream of denying it. But everyone has been talking about the EDL for a bit now so let's start there. 'm really curious because I see a lot of this nowadays where someone will label themselves as something and then go on to lay out some ideas that don't seem to fit with the initial label. For example, in my freshman year I had a roommate who was a self-described libertarian. He was very religious and very clear about being anti-abortion, anti-drugs, etc. etc. I thought Libertarians were supposed to be for individual choice, therefore, for abortion and drugs. Yes it is a problem, the same thing happened to UKIP and, as you say parties on the left. It used to really piss me off when I was at university and they used to organise marches against student loans and the like and all these socialist worker marxist groups would get in on the action and render the whole protest meaningless. so this is why i think groups need better tools for policing what they allow and what they don't allow. i.e. in the US the two parties are getting pulled apart more and more by their more radical elements. i'd rather be voting for a socialist than a socialist pretending to be a democrat. i'd rather be fighting against a racist than a racist pretending to be something else. A few years ago, "libertarianism" was in vogue for younger conservatives who didn't want to be associated with the grey old men of the Republican Party or finger-wagging Bible-thumpers. There was quite an active group ("Young Americans for Freedom", I think) on the last American campus where I worked. The deeper you dug into it, though, the more they began to resemble standard dusty conservatives. They didn't advocate vocally for cannabis legalization, for instance, and joined in with "Blue Lives Matter" campaigns, and so on. I think it was basically just young conservatives trying to put a cooler spin on their dads' political philosophy. That's fine, but was probably confusing for those attracted to a stricter definition of libertarianism. We used to say that straight edge kids were basically just trying to make Mormonism cool. I think a similar thing happened with conservatives and self-described libertarians. Not sure 'Classical liberals' would describe themselves as progressives either. I'd say they are broadly people on the left who don't believe in identity politics. It must really rankle with them when they constantly get called right wing for not agreeing with the latest SJW BS. Anyone who is liberal/conservative/socialist/libertarian/neo-liberal/neo-conservative on everything and believes those apply to every situation during all times is mistaken. Sometimes you need a socialist situation, sometimes a conservative one, and while that socialist solution might work in one country, it won't work in another. It all depends on the circumstances. I just can't stand people who are reflexively left/right on all issues. There was quite an active group ("Young Americans for Freedom", I think) on the last American campus where I worked. The deeper you dug into it, though, the more they began to resemble standard dusty conservatives. Funny you bring up YAF. My roommate joined YAF freshman year and was super active. But, on our campus they weren't known as a libertarian organization at all. They were mostly known for planting a bunch of little crosses in the ground in one of the main university yards (to protest abortion) and for inviting Ben Shapoopiepants to speak. Yeah, there's a section on this in that video, about removing the taint from the term progressive. I agree with Pakman. Insofar as I understand the tradition of progressivism, it generally aligns with my views (but yes, not in all situations, all of the time). I'm not ready to sacrifice that term to some self-righteous college kids on Twitter and an oversized Fox News moral panic. I think if you were to somehow quantify the total, chapter-by-chapter activity of YAF, 90% would consist of inviting Ben Shapiro to speak. So it's even white people's fault that Asians are racist towards black people. Yes, Asians never had a racist bone in their body before the white man came over and corrupted them. You don't think that the vast majority of white teachers who come over here find themselves battling against Korean racism on behalf of black people at one time or another? I certainly have. they should not even get a job teaching in Korea. BTW, the message I wrote was directed at OP. BTW the Meghan I wrote was directed at OP. Fine, in that case don't refer to 'racist white people' when you're actually talking about one person who you think might be indoctrinating his students, even though there's no evidence for this. I'm wondering if there are many new Right or Alt Right EFL teachers in Seoul. 100% of the teachers I work with at the university level are Liberal, Leftists, Feminists, lesbians and homosexuals. I've never met anyone who is actually on the Right. I've met a few White Canadian males who are CivNats, or Libertarians, but that's it. I'm just curious if there are any White males in Korea who are on the new right. Korea for some reason has foreign teachers over represented by liberals and sjw's much larger than the population back home unless home is California, Hawaii, New York, Toronto, etc. As was pointed out earlier, young people are more likely to be on the left , as are people who majored in arts and social sciences. 1. The alt-right is not defined. 2. The alt-right is not uniform. 3. Not everyone in the new/alt-right is racist, in fact most aren't. 6. Korean racism is because of Koreans, not whitey. Plenty of Koreans hate white people as much as black people. 7. Plenty of black and Muslim and white folks come to Korea. Most are great. Some start spewing political crap and racism either towards different foreigner groups or towards Koreans. That's everyone. That's people. 8. If you look at this forum, A LOT of the anti-Korean bigotry comes from people on the left. Hey, I'm curious about something, since I've seen it come up elsewhere, maybe in other threads here and on Reddit. How does one qualify as an SJW while living in Korea? What kinds of activities are people doing to earn this status? Are people trying to take down their hagwon bosses for using "problematic" language? That seems unlikely. Throwing chairs through the window when a conservative speaks at a Korean university? Given the laws here on foreigners and protests, I doubt it. Are they organizing viewing parties for livestreamed broadcasts of American campus demonstrations? I've worked with dozens of foreigners in Korea and have had a conversation about politics with maybe five of them. None of those conversations indicated that they spent their free time SJW-ing. Apparently, though, this stuff is all over the place. Let's say I wanted to get in on the SJW action. Where would I find it?